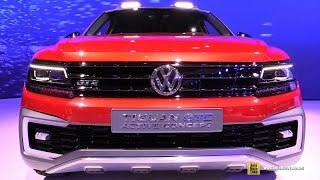 At the Detroit Auto Show, Volkswagen unveiled its all new Volkswagen Tiguan GTE Active Concept 2016. The SUV Concept is based upon the second generation Tiguan and gets power through a plug-in hybrid system. Not only these, but the roguish model brings with it some great features inside. 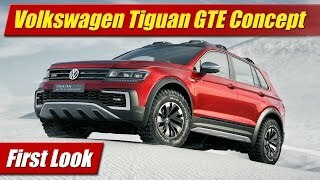 Let us have a look at the review of Volkswagen Tiguan GTE Active Concept 2016 to know in detail about the integrations and the specifications. The interior of Volkswagen Tiguan GTE Active Concept 2016 is molded to serve the safety purpose keeping in mind luxury and comfort. The dashboard looks clean and comes mounted with a 9.2 inch touchscreen supporting gesture control. Talking about the safety inclusions, it has automatic post-collision braking and active hood with front collision detection system. The center console features 4Motion Active Control unit allowing you to toggle between the available six driving modes. Talking about looks and comfort, the dual tone interior portrays white seats with contrast red lining along the sides. The same essence can also be noticed over the front arm rest. 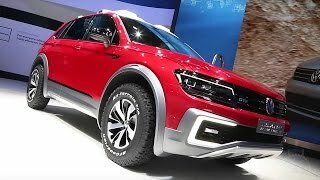 Thus rounding up the interior details of Volkswagen Tiguan GTE Active Concept 2016 I would say, it is a production friendly design which we can see in near future. 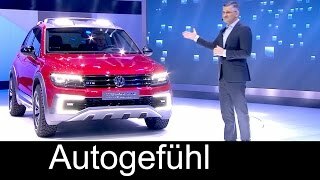 Hiding the decent interior you have the roguish exterior of Volkswagen Tiguan GTE Active Concept 2016. The sportive lines and skid plates below the front bumper add to the glory. Starting with front the full-width grille touches headlights while the C-shaped LED daytime running lights find house over the bumper. The wheel arches provide required off road space to the massive sportive wheels. Moving towards the rear you’ll notice the dark roof panel with some additional lighting. 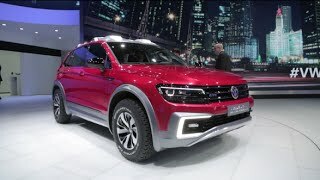 The saga of sportiveness and roguish attitude continues to the rear end and thus the exterior of Volkswagen Tiguan GTE Active Concept 2016 narrates you lots of off-road aggression, sportive looks and the barbaric monster feel. Beneath the hood of Volkswagen Tiguan GTE Active Concept 2016 is a plug-in hybrid power bank. The four-cylinder engine generates total output of 148 hp and peak torque of 250 nm while the pair of 54 hp and 114 hp electric motors delivering power to the front and rear wheels respectively make the model more furious. Thus the total output throbbed by the concept comes to 221 hp. Only on E-mode the concept can attain top-speed of 70 mph while with its entire power the top speed of Volkswagen Tiguan GTE Active Concept 2016 touches mark of 120 mph and the 0-60 mph sprint can be knocked in 6.4 seconds.